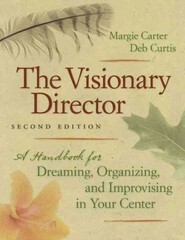 The Visionary Director 2 Edition An inspiring and practical guide to creating a larger vision in early child care, this popular professional development tool has been thoroughly revised and offers a concrete framework for organizing an early childhood center director's ideas and work. Updated and expanded, it reflects new requirements and initiatives for center directors and addresses topics including cultivating a vision, developing "systems thinking" for management roles, implementing principles and strategies for mentoring, building a learning community for adults and children, and bringing visions to life. The Visionary Director provides directors with information to perform their jobs with motivation and creativity.